EVERGREEN, CO — The two most important people in anyone’s life are their parents. They are the first two people who start shaping your character and are the ones whose influence are everlasting. To a great extent, we are all products of who our parents are. Among many things, I have learned honesty, integrity and kindness from my father, but it was my mom who shaped my entrepreneurial spirit and taught me to aim high and work hard to achieve my goals. She is an architect and a very successful entrepreneur herself. She was one of the first women to successfully own and operate a private vocational school in Tehran. She later moved back to the United States and pursued her Master’s Degree in Environmental Engineering and is now pursuing her Ph.D. in the same field. When I was sixteen, I started my first business under her supervision. I signed up a contract to draw some mechanical plans (using AutoCAD). I ended up making the equivalent of $16 and I managed to purchase a pair of jeans for myself. That will always be remembered by me as the best business experience of my life, no matter how much I go on to achieve. Since then, I have entered and exited a number of business ventures. None of them suited me until I learned about SEO while working at Page1Solutions. In the one year that I worked there, I learned many invaluable business lessons from its Director, Dan Goldstein. When I left, I decided to start Millionairium. With no financial backing (except my wife’s credit cards and student loans) and a downward economy, this was a big challenge. It is thanks to hard work, support from family and friends, and having great employees and clients that we have a profitable SEO company, which is now one of the best in the industry. But that’s not where we want to stop. Aiming high to me means that we plan to become the #1 Google SEO provider in the world by 2018. What does it mean to be #1? Any business is given value based upon its profitability as well as revenue, but I want to add customer loyalty, satisfaction and beating our competition in any market as factors into the equation of what it means to be the best. To become the best, we need to fully understand the big players in our industry, their strengths and what we need to improve upon to achieve our goals. 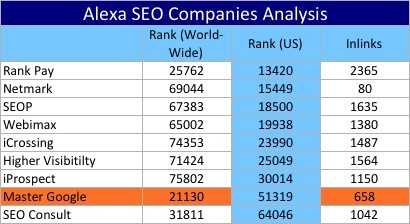 The data below is what I have gathered through Alexa, as well as Top SEO’s. 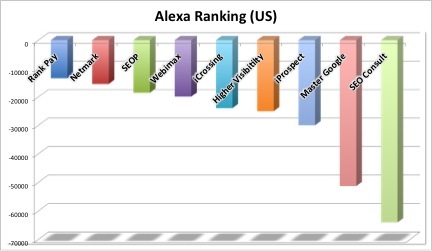 The table shows where our company stands in comparison to the big SEO players in terms of Alexa rankings (traffic to the site) as well as inbound links. I’m fully aware that these two are not the only criterion for comparing companies. Other factors include sales, client retention rates, achieving SEO goals and having strong guarantees in place, as well as offering a diverse set of services. 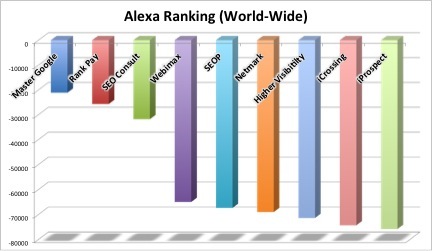 According to Alexa, our company ranks above ALL of these companies in terms of traffic to the site. However, when comparing traffic from the US (next table), we rank AFTER most of them. Due to offering numerous free services, including many SEO articles on our blog, our site has lots of visitors from many countries. We need to however work on attracting US based visitors to our site. 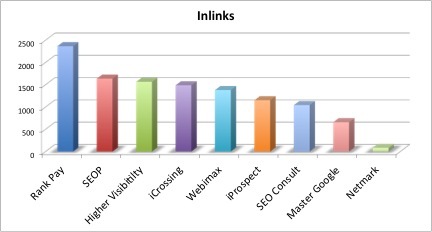 Also our site has less inbound links than most of our competitors (see below). One of our goals is to improve our site’s popularity within the next few years to have more sites refer us by linking to us. If you’ve read this post, that means you care for our company. We appreciate your support. Please leave us your valuable feedback and what you think we should do to achieve our ‘becoming the best SEO company’ goal. I was working for Master Google since the beginning, and I know how hard Ali worked for this company. I am proud of him, and I am sure Master Google will reach the goals sooner than what you expected. I am proud of you as a team! Your goals and your comments match! As Ali\’s mother, I am humbled by his comments and need to say that it was brave of him to sign a contract at the age of 16. He stayed up three nights because his partner failed him and he wanted to keep his promise. That is probably why he loved that pair of jeans more than any clothes he ever had! I am sure you will succeed in your goals and that is because of the feeling of family I see amongst your team. I am joyful to be a part of my work family even after eight years of closing the business. Yes, we have kept in close touch with past employees because we worked hard and had fun together for years. We loved each other so much that regardless of success or failure, we would look forward to go to work everyday. We had learned that if we stuck together, success and failure would be precious and they made us stronger and wiser. In your team I see the same spirit and look forward to seeing you grow more successful everyday! God bless you all. What a wonderful comment! I see that the drive to succeed and appreciation for it runs in the family. Thank you for posting. Ali, you have a great heart and inspiration, and you are working very hard and dedicated to your business. You care about your family, employees, clients and earn every penny that they pay you, your parents love you and proud of you, your employee are happy and care about you and Master Google, and on top of all these, The Almighty-God loves you, so is there any reason that you will not be number one in the world very soon. I am positive and confident that it will happen sooner than 2018. God Bless you! Seeing these future goals proves how ambitious and dedicated this company is. I am proud to be a member of the Master Google team. We all have the goal of getting our clients to the top, and we work together to exceed this goal. Ali, I really appreciate this posting, especially the perspective that according to Alexa, our company ranks above most internationally, but when it comes to US traffic, our Master Google team has our work cut out for us. I know that we are up to the task. With our current level of success, I am excited to see how far this company goes… we will be #1. Thank you for this post. Thanks everyone for your feedback. You are truly the best team. Ali, thank you for this post. I am thrilled to be writing for Master Google, and I believe that we will all continue to grow together. So many veteran employees have helped me out, and I\’m glad to be part of a team that values communication and hard work. Cheers! It is so very exciting to read about our goals for the future. While we are not number one yet, I feel like the services we offer are above the rest. We are a team of dedicated professionals who understand the needs and wants of our clients inside and out. Making our clients our number one priority is what sets us apart. I know that we will meet and exceed our goals and I am so happy to be a part of this wonderful company that looks so confidently forward. Thanks to God for making this magic chance for me to be one of members in MasterGoogle team. You excited me to persist more on my goals by this post, hope you can achieve your ideal so sooner before 2018. Really you are doing well. I read your posts after receiving your newsletter. Everytime a get some valuable information. The feeling of belonging to a family is not what you can find in the most of the companies. But MasterGoogle has got this feeling and its success is mainly based upon that. I am also happy that I am part of the Master Google’s team. I want to emphasize that our employees are our real assets. Our main goal has always been to create long-lasting values for our clients, employees and investors. Each of us are like a small piece of a big puzzle, with everyone’s contributions we will be able to operate smoothly to help our clients. I am confident that we can become the best SEO Company pretty sooner than 2018. We know exactly what we want, we have the intuition we best know the market and industry we are playing in and that’s the reason we will achieve this. I think our main strength is that we know the desired result is not achieved overnight and it needs patience and hard working, so we never get disappointed. I believe that for being the best in any industry, business owners (every employee should believe that they are business owners, and everything they do they do it for themselves) should just think of long-term success which will happen by providing the best possible service at any time. They might have no profit for a long time (we have passed this time), but the guaranteed success will come after that which will last for a long time, usually forever. If we want to be the best, first our clients should be the best in their industries. Their business is our business. So we should be always on top of new SEO techniques to make sure that we can bring traffic to their sites and also transform that traffic into profit. I think in the realm of SEO, keeping the knowledge up-to-date is really important. Now we know so many SEO techniques, but it\’s not enough in my idea. We should be always a learner and try to be one step ahead of search engines. Put it all together, we have experienced so many ups and downs, but i believe that we can become the best SEO company. It\’s very close if we keep up the hard work. However I’m a new member of MasterGoogle, I can really feel the positive attitude and dedication towards the company’s success in all my colleagues. This satisfying milieu makes me to know myself as part of a purposeful effort to accelerate my company’s promotion, do my best to be an effective member, reach all my goals in the company and even try to go beyond them. I feel confident that if all of us try to save and protect this precious asset and keep up the good work, becoming the best SEO company is the definite result. First of all, I will pray for your #1 achievement in SEO field. Secondly, as per my opinion, if you provide content improvement up to 50% on Free SEO Service according to the best keyword for any website, I think this will prove reputable for your firm in the future, because most SEO Companies just provide their SEO service according to content provided by the client, whereas this content fulfills the requirement of SEO. Lastly, your firm will be absolutely in top position before 2018 by keeping close eyes on Google, Yahoo, Bing, and other search engines strategies. These are lofty goals, but exciting goals. I couldn\’t mean this more sincerely: I am proud to be a part of this team and exciting about where this company wants to go. First of All hat off to your mom & after going through from start to finish, your enter and exit process unless you connected with SEO is same as mine but I found Freelance instead of SEO. Although right now my focus is on SEO and other Web tools. Now, as I have read the whole document, I must say that all you need to achieve the goad is courage and determination and I am sure you have more than that. As a student of SEO, you are a decent teacher for me and your articles are just like books full of education that we need and I am sure you will achieve your goal way before 2018. Good luck !